Sixteen days ago the Space Shuttle Endeavour blasted off from Kennedy Space Center into the night sky. Its return Wednesday also came under the cover of darkness. The shuttle's first opportunity to land at KSC was slated for just before sunset, but the weather didn't cooperate. NASA mission managers called off the attempt because of concerns over clouds in the area. The next chance to land was after dark and still at risk of being too cloudy. 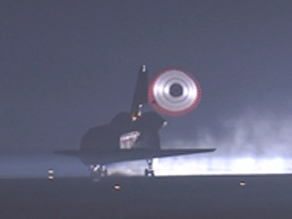 Shuttle Astronauts train for night landings, but they can be more difficult. Before Wednesday only 21 had been done in the shuttle program's history. We waited in the press center for the latest from NASA's weather experts. Meanwhile over our heads an astronaut flew the shuttle flight path in a special aircraft designed to simulate the shuttle's reactions in the weather conditions. In Houston NASA mission control poured over the latest weather readings. If they "waved off" the shuttle on this landing attempt the orbits wouldn't line up for another chance to land at KSC until the next day. After what clearly were serious discussions, and a conversation with Endeavour Commander Dom Gorie, NASA managers made the final call. They asked the shuttle flight crew to fire the engines slowing the orbiter to begin its decent. As the shuttle worked its way down over the Yucatan peninsula, we stood at the CNN live location and watched its path on a monitor. The first sign of the shuttle entering the area were two loud bangs in quick succession. The noises sounded a bit like fireworks but were actually the nose and tail of the shuttle crossing the sound barrier. We kept our eyes glued on the night sky but from our vantage point the only sight of the shuttle visible was on our TV monitors. As we watched the live feeds a bright orange flame pulsed from the top of Endeavor near its tail. The bright flame looked alarming – but was actually nothing to be concerned about. The fire is part of the exhaust from the shuttle's auxiliary power unit. It actually shows up on every flight, but is much more apparent when it's dark out. Thursday the Shuttle astronauts will head back to the landing strip to catch a plane home to Houston. That flight is scheduled for the afternoon – not in the black of night. It would have been nice to watch it on CNN; fortunately NASA TV's website didn't fail me. I applaud the shuttle crew for the excellence in their training, a night launch, a long mission, and what I would call a very difficult night landing. I have landed jetliners at night and I know how difficult it can be to land safely in the dark. The Shuttle is the ultimate challenge in landing an aircraft. Far more challenging than a 747-400 or helicopter. It's good to see the shuttle crews getting back safely. I look forward to seeing this trend continue for future missions! There are many shuttle missions planned for this year and each one brings us closer to the time of their ultimate demise. In 2010 the shuttle fleet will be retired replace by the Orion in 2014 or 2015. How have we progressed since the first shuttle launch into space in 1981. 1) The space shuttle gave us the capability to land on a runway. The book is still out on the method of landing for Orion with a water landing still seriously debated. 2) The space shuttle has a capacity to carry over 50,000 lbs of cargo (28.5 degree orbital inclination) and seven crew members. The Orion can carry a maximum of six crew members. 3) The space shuttle orbiter is reusable. There are no current plans for the Orion to be fully used over and over again. 4) The space shuttle can bring back a substantial amount of cargo. Orion will have minimal cargo back capabilities. Just to be fair the Orion does give us interplanetary mission capability which the space shuttle doesn't have. However these are vehicles that should be complimenting each other rather then competing for the same space dollars. During the almost 5 year hiatus between the last shuttle flight and the first Orion flight, how will we maintain our expertise? How will we maintain the astronaut corp., with veterans leaving because of no potential flights. We shouldn't have this problem of choosing between Orion and the space shuttle. Will we have to depend on the Chinese and Russians to fly our astronauts into space. If the flames were normal at the one engine of Endeavor, why were there no flames on the other engine? You could hear a noise coming from that engine. I did not hear that on earlier flight landings. What was burning? Unburned fuel? During the entering of the atmosphere, I heard them talk of a fuel dump. I had not heard that before. Is this connected? I was 31 years a mechanic and just interested in answers. Reply to Straight Talk You can find out much more about drill ship and semis availability and age, by going to the net.You can find aactul rig counts in any part of the world, just about. It is not only rigs, on and offshore, that are in drastic short supply, but everything that goes with them, like drillpipe, casings, downhole pumps, pipe handeling tools, cementing units, and completion equipment, but probably most of all, experienced men, according to drilling friends in Trinidad. Young people don't want to get stuck out half their lives on rigs any more, to learn what they need. I'm really not into the bidding and all that process, which to me is a dark deathly subject, full of stealth and politics. I just stayed with the rigs. The net can fill you in on most of that, if you just ask the right questions. For instance, go, on Google, to Barbados Offshore Oil Leases, and you'll get all the maps. Anybody in the world, can see the blocks there. Now the steam. We drilled five steam wells in the Sulhur Springs area of St Lucia in 1975-6. Great fun and exciting, and at times horrifying, and very noisey when the wells were being tested, . etc. But all that is an old story, of long ago, and the Trini crews took over all the nice girls in Soufrier. 2018 ????????? ??? ?????????? ?? ??? ?????????????????????? ?